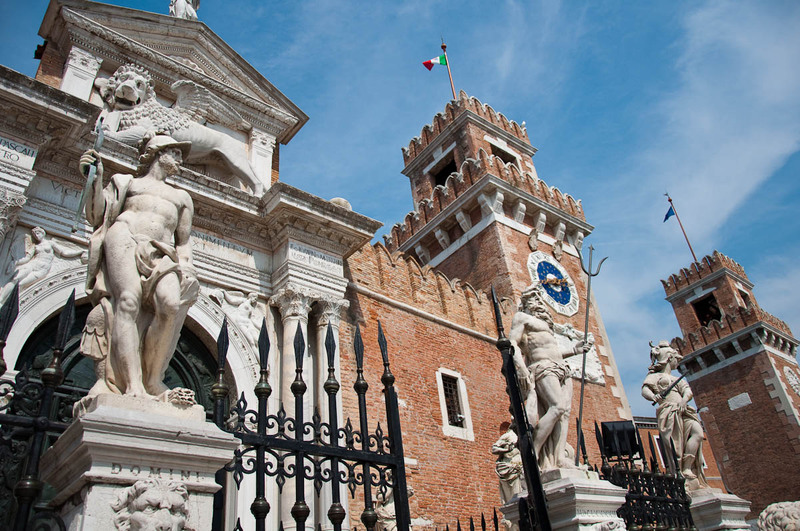 If you find yourself in Venice with an hour to spare, make sure that you spend it visiting the Arsenale’s Porta Magna and the adjacent Ships Pavilion. Visiting Venice without dedicating some time to exploring its seafaring past, is a bit of a shame. And that’s really an understatement. Through the centuries of its existence the Most Serene Republic of Venice boldly established and developed numerous trading routes and expanded significantly its influence and territories thanks to its advanced shipbuilding knowledge. had the capacity to produce nearly a whole ship each day. Called Arsenale di Venezia (Venetian Arsenal) it developed its own shipbuilding moving production line and it became the largest industrial complex in Europe prior to the Industrial Revolution. 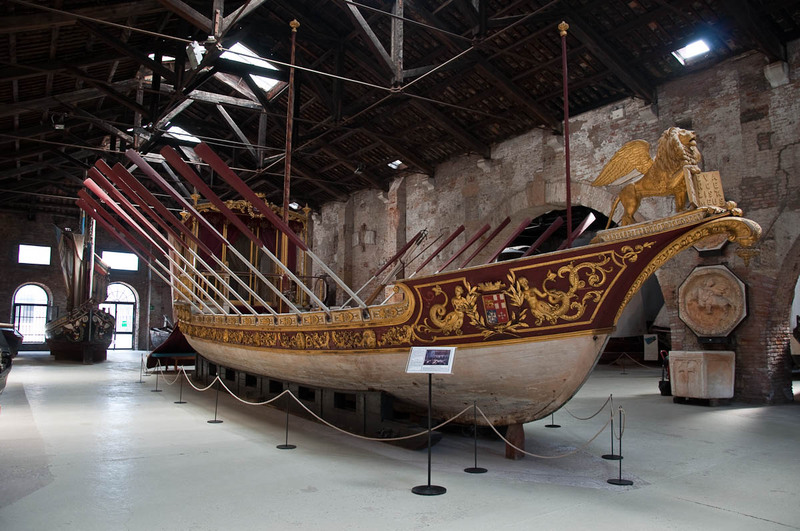 Both merchant vessels and warships were produced at Arsenale and by the first half of the 15th century Venice had over 3000 merchant ships in operation. 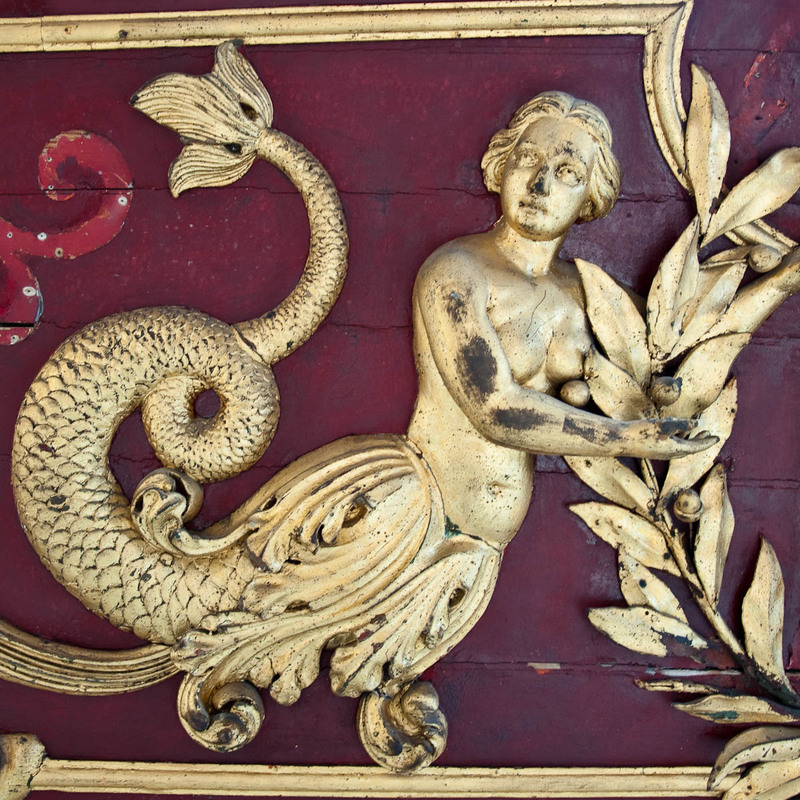 A huge trade and naval power generating immeasurable wealth for Venice – the legacy of which we can still see nowadays in the splendid palazzi and rich collections of art which make the city on water such a gem to behold. Heck, Arsenale was of such importance, that not only it employed Galileo Galilei as one of its consultants, it was even mentioned in Dante’s poem Inferno. 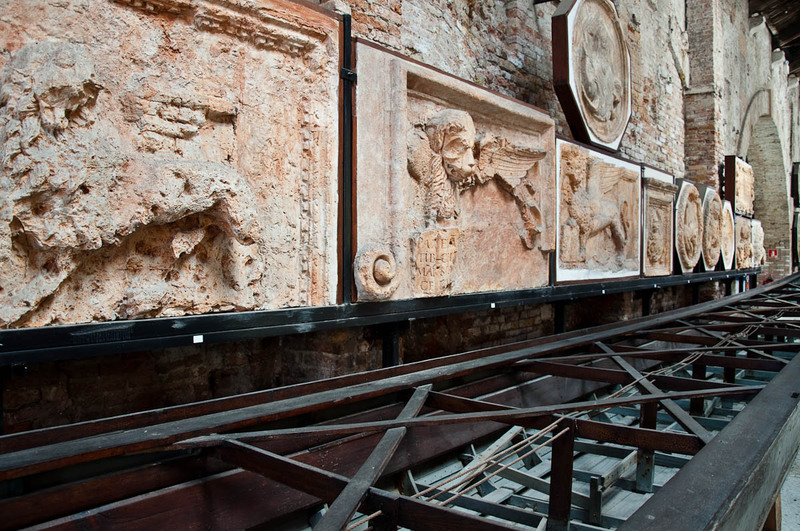 Nowadays, Arsenale is still quite instrumental to Venice. 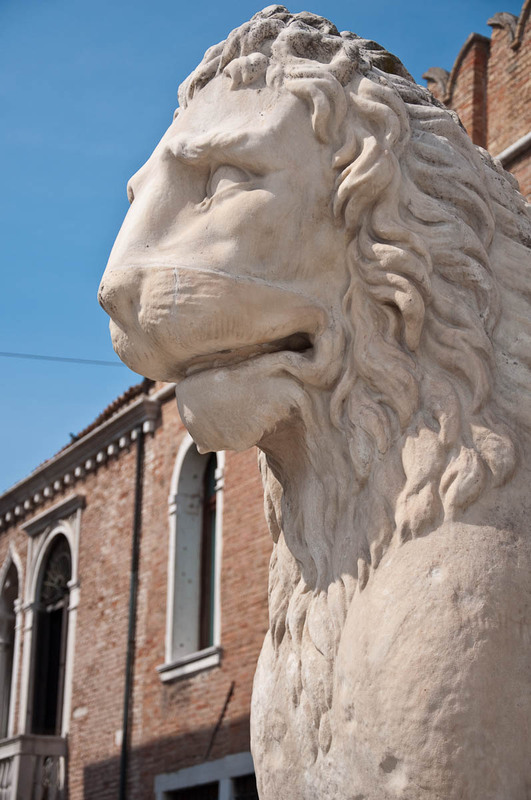 About two-fifths of its area is a military zone, while the rest of it is used to stage large events like Venice Art and Architecture Biennales and even some of the happenings of the yearly Venetian Carnival. 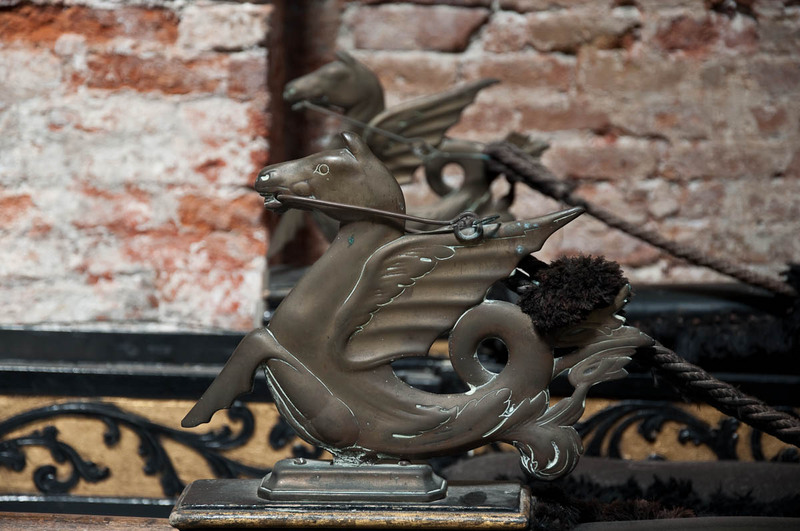 If you have some time at your disposal, click here to find out how to visit and explore Arsenale at your leisure. and the adjacent Ships Pavilion (where you can admire, among other things, the 19th century Royal Barge). So, yes, to get there you need to leave the hubbub of St. Mark’s Square behind you, then (once you find yourself between the Doge’s Palace and the granite column crowned by the winged Venetian Lion) turn left and walk straight ahead for about 15-20 minutes (depending on your speed and the density of the incoming crowds). You will pass by the Bridge of Sighs, the Victor Emmanuel II Monument, the church Santa Maria della Pieta and then you need to continue down the lively promenade of the Riva degli Schiavoni, followed by the Riva Ca di Dio until you reach a wide straight canal by the name of Rio de l’Arsenal. Of course, you can take a vaporeto, too. The stop you need to get off is called Arsenale and it is served by lines 1, 4.1 and 4.2. I have always preferred to walk it there though, as the St. Mark’s Basin brims the promenade offering stunning views across to the island of San Giorgio Maggiore, to the Doge’s Palace and the constant gondola and boat traffic. Just be aware that in summer, this walk can prove quite exhausting and hot, as the promenade is wide and largely exposed to the sun, so wear a hat and lots of suncream. Once you reach Rio de l’Arsenal, just follow its right bank (called Fondamenta Arsenale) and soon a splendid vista will open up right in front of you. Two towers – one on each side of the canal – stand proudly upright revealing behind themselves glimpses of Arsenale’s immense premises and workshops. The towers most likely used to form part of the 3.2 km long rampart which surrounded Arsenale after its expansion in the 14th century. The left bell tower has a beautiful clock embedded in it. 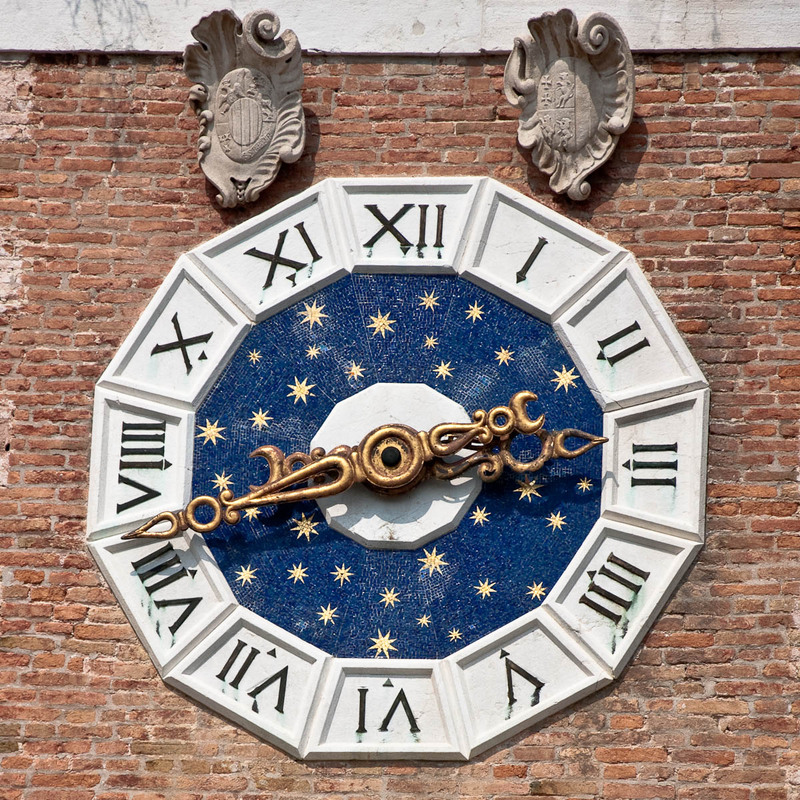 It is the only duodecagon-shaped clock in all of Venice. 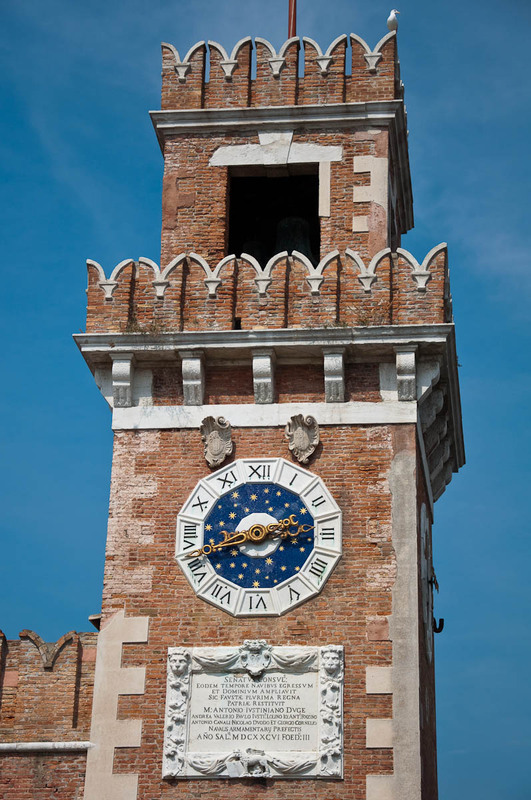 Its Roman numerals are positioned within trapezoid shapes and the blue face of the clock is sprinkled with gold stars. A wooden bridge connects both banks of the canal. It juts high up in the air, forming a perfect sharp angle on top, before descending steeply down to the other side of the canal. I dare you to occupy the prime spot – right on top of the bridge’s summit – and take a perfectly symmetrical picture of the two towers for yourself. No such luck for me, I am afraid. All the time I was there, a professional photographer with a huge lens was honking the spot for himself. Eventually a man in a white uniform slowly walked across the bridge connecting the two towers. He would stop every now and then, look at the photog and pose. The photog was firing the camera like there was no tomorrow. ‘A-ha!’, I thought. There was a photoshoot taking place. Hence I had to leave, but not before I promised myself that I would return some other time to claim the top spot for myself. Right at that moment something else caught my eye. 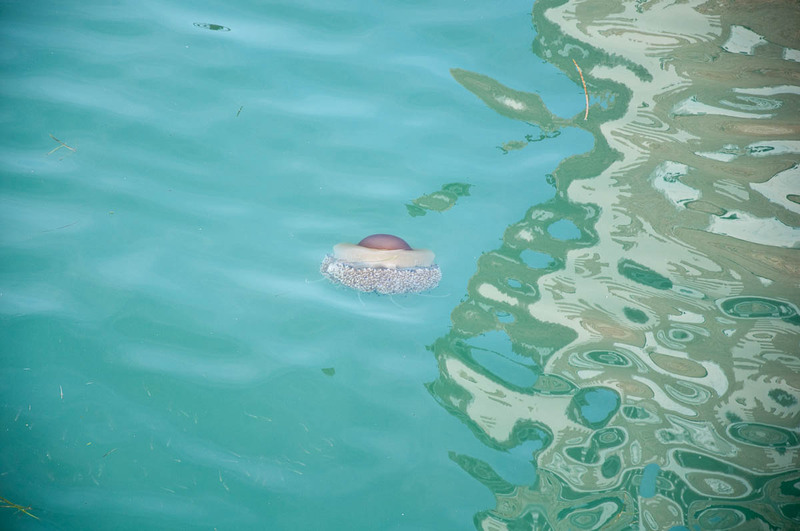 A huge jellyfish was swimming in the canal below the bridge. A bunch of tiny silvery fish hovered nearby it. 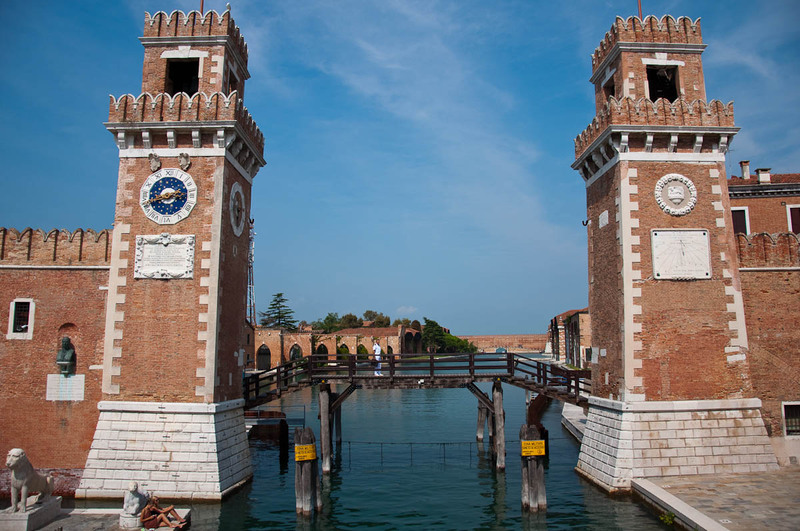 Anyway, once you walk across the bridge, you will find yourself by the splendid Porta Magna – Arsenale’s land entrance. It was built in 1460 and it is famous for being flanked by four lions – each of different size. The lions were booty of war. The first lion on the left is the biggest. It is an ancient Greek statue and it was brought to Venice from the port of Piraeus in Athens after the conquest of Peloponnesus. There is a small square right in front of the Porta Magna. It offers a bit of shade for you to sit down among the locals. It is the perfect place to take a short break to admire the gate, its statues and its architecture. 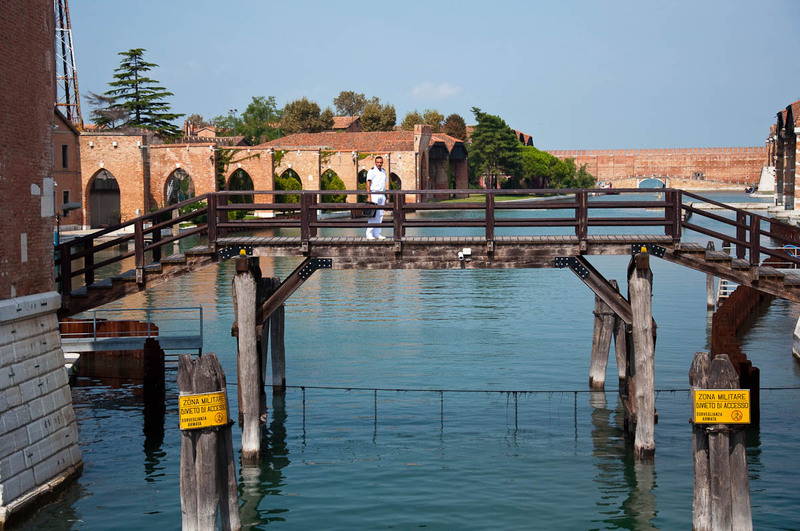 Castello – the Venetian borough (or sestiere, as it is locally called) where Arsenale is located – is a bit further away from the city centre and thus it usually lacks the huge crowds of tourists which besiege the more widely popular parts of Venice. So, take your time to sit down and relax, watching old ladies talking to each other, while long lines of freshly washed clothes dry up on clothes-lines suspended beneath windows and between the colourful buildings lining up the canal. Once you have had your fill, cross the bridge back again and you will spot a long brown building right next to it. 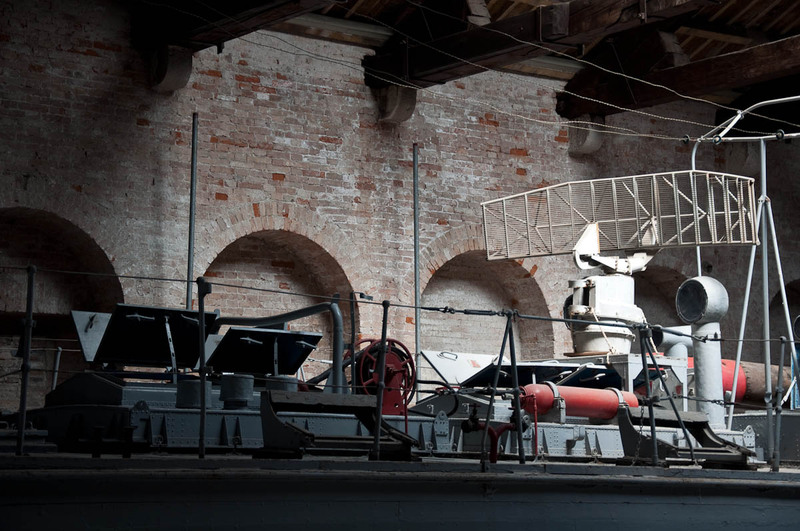 This is the Ships Pavilion – a huge workshop built in the 16th century. It was used for the production of oars until the middle of the 19th century with one notable exception: after a big fire devastated the Doge’s Palace at the end of the 16th century, this building was quickly adapted to temporarily host the meetings of the Great Council – the main government body of the Most Serene Republic. 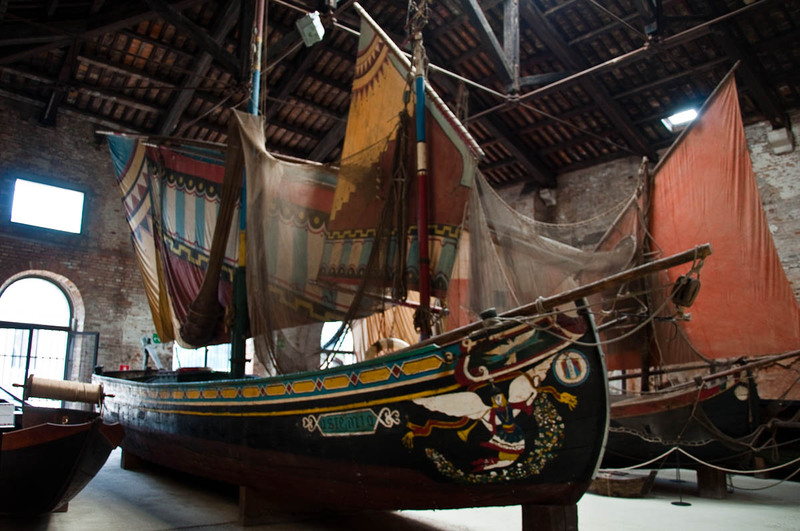 Nowadays, the former oars workshop has been turned into an exhibition space housing a number of splendid old boats, ships and gondolas showcasing the naval power and glory of Venice. Called the Ships Pavilion, it forms part of the city’s Naval History Museum, which is located just further down the canal. Unfortunately, the Naval History Museum and its 42 rooms have been closed for extensive refurbishments since May 2015 and I was unable to find any information as to when it will be opened again to the public. I even called the museum to ask, but no-one answered the phone. 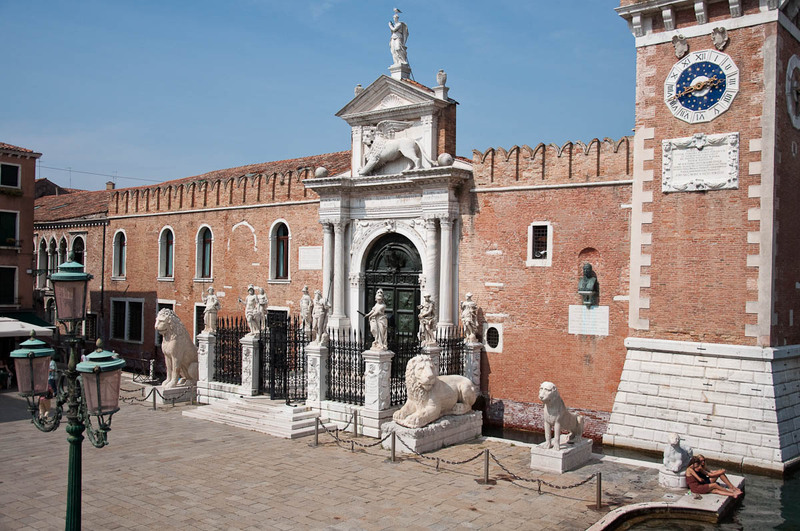 My tweet to the Foundation of the Civic Museums of Venice went unanswered, too. So, in the meantime, a visit to the Ships Pavilion is really the best you can do. It houses some stunning vessels and other interesting artifacts. The pavilion comprises several large rooms and you walk from one into the next to admire the different boats they house. 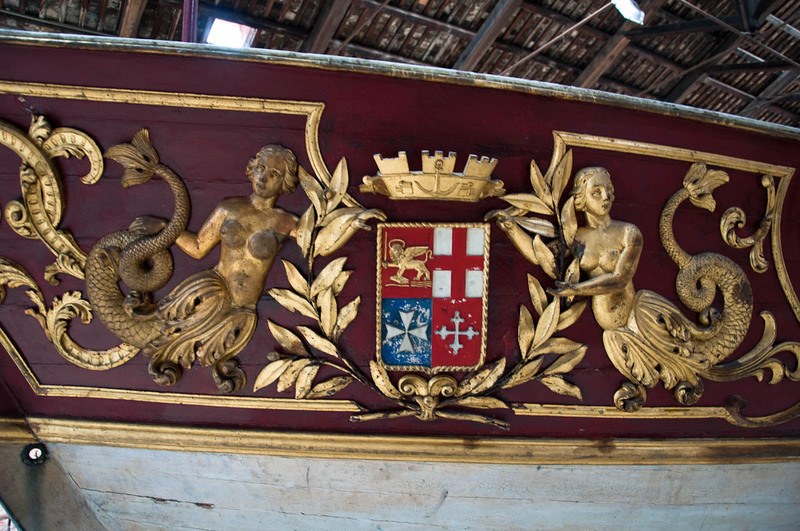 I loved seeing the Royal Barge which was built as a state vessel in Arsenale in the first half of the 19th century. It was used in 1866 by the Italian king Victor Emmanuel II when Venice became part of the Kingdom of Italy. 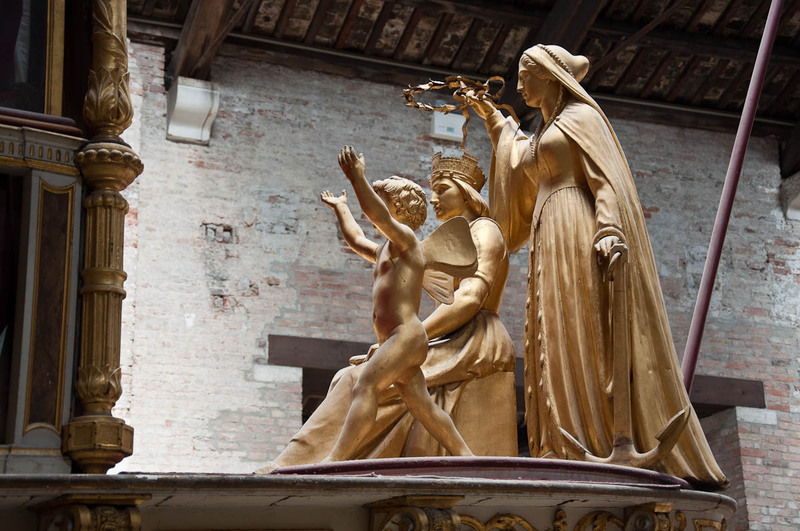 For this occasion the gold-leaf statues at the stern were arranged so as to show Italy being crowned by Venice. 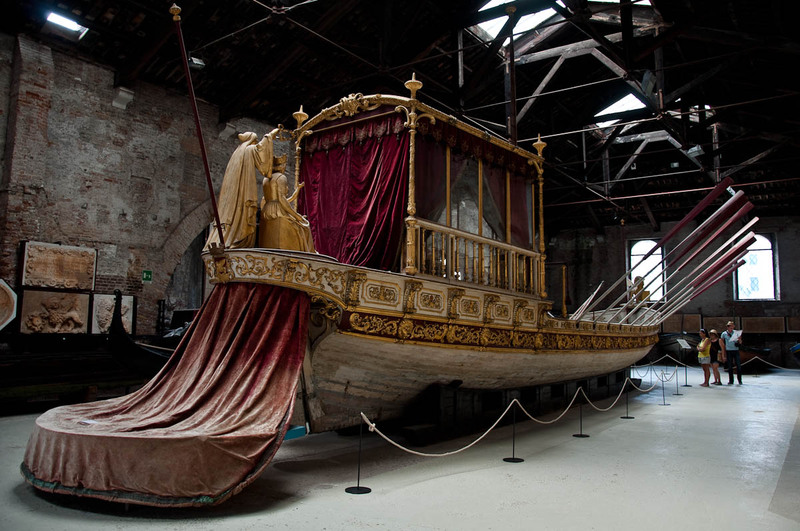 The vessel was used for the last time in 1959 to carry the body of Pope Pius X for the funeral service at Venice’s St. Mark’s Basilica before he was buried in Rome. 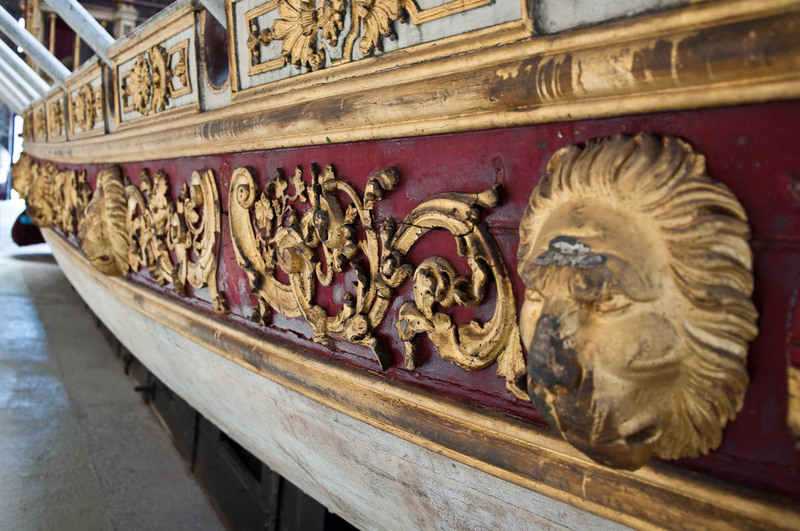 The royal barge is 18 metres long and 3.2 metres wide and I loved its gold-leaf ornamentation. 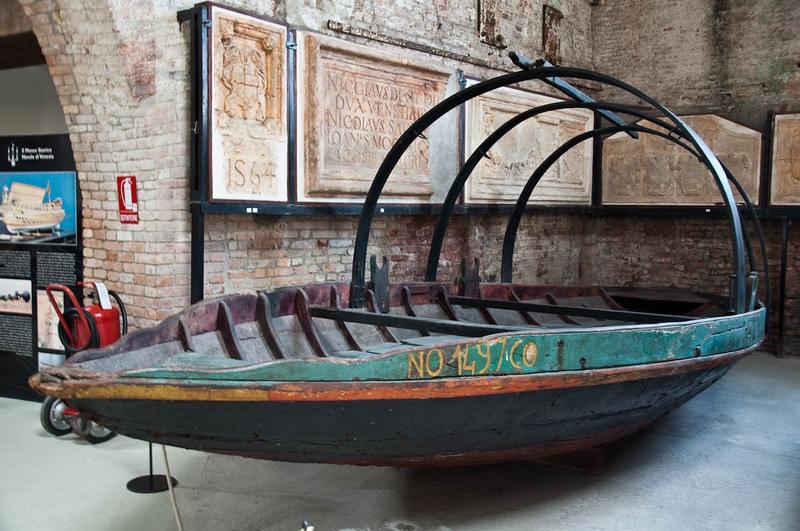 Alongside it you can also see a few black gondolas which were used by the Doges of Venice. 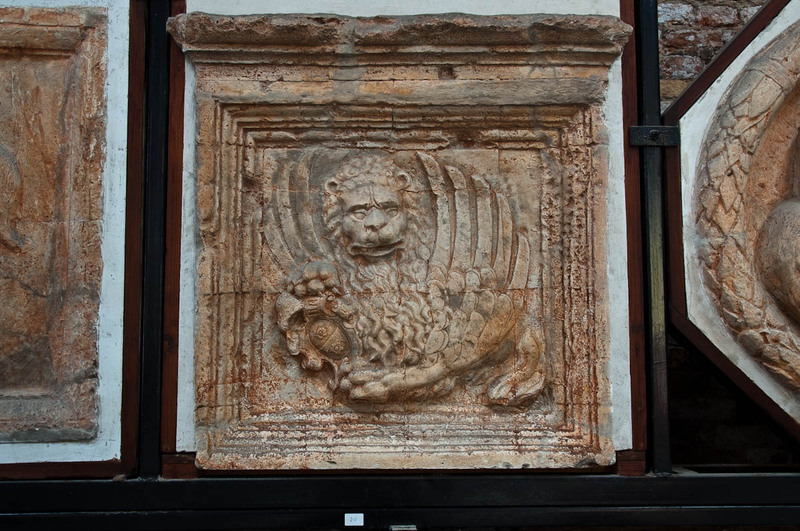 The walls of this room were covered with stone slabs with bas-reliefs of the Venetian lion. I loved seeing the different artistic interpretations of this perennial for Venice motif. 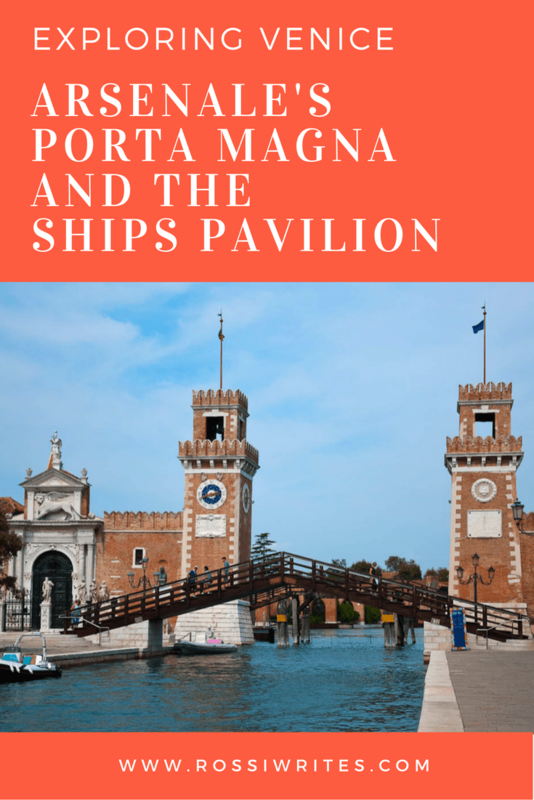 Apart from all the amazing boats and artifacts you can see in it, a visit to the Ships Pavilion turned out to be a great idea on a hot Venetian day, as its rooms are cool and dark. I remember sitting on the low ledge of a huge open window and just spending a few quiet minutes surrounded by the boats and taking it all in. So, yes, definitely. 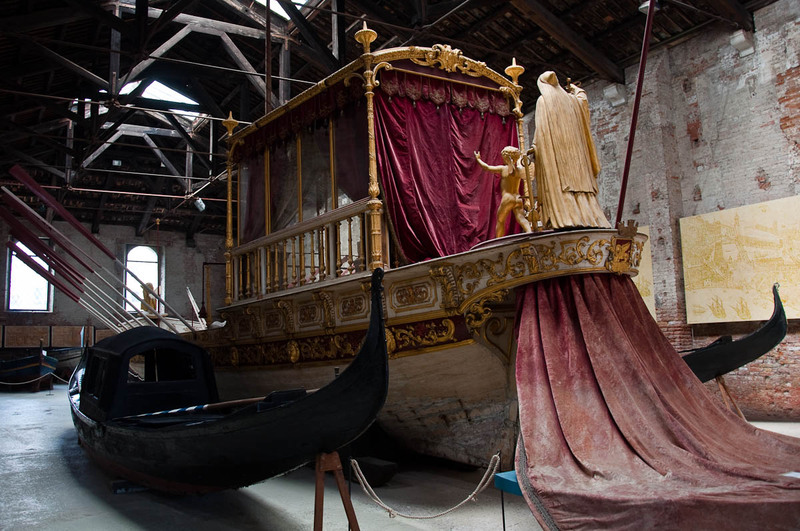 If you have an hour to spare in Venice, head over to Arsenale’s Porta Magna and the Ships Pavilion. It is a very nice and picturesque walk from St. Mark’s Square and it will give you a chance to appreciate the place which allowed Venice to become one of Europe’s biggest political, trade and military powers ever. 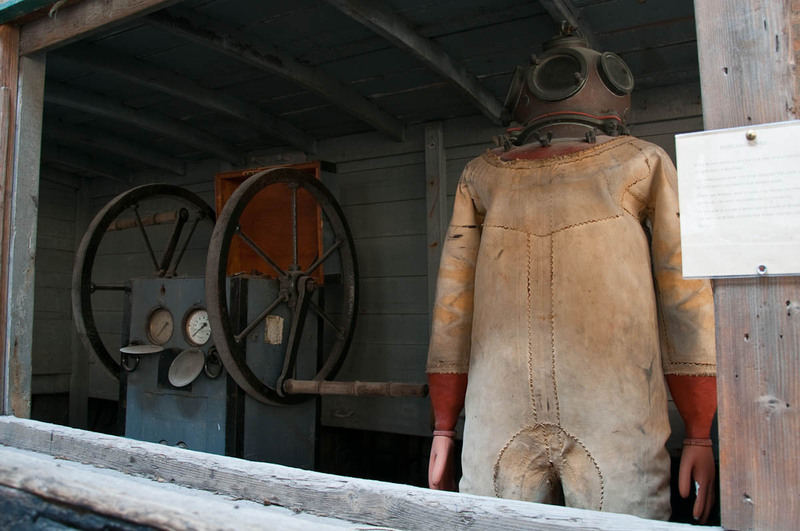 Have you been to the Venetian Arsenal? Did you manage to squeeze a visit to the Naval History Museum before it was shut for refurbishment a year and a half ago? Which one is your favourite place in Venice? Share with me your thoughts and impressions in the ‘Comments’ section below. I would love to read them and engage with you. 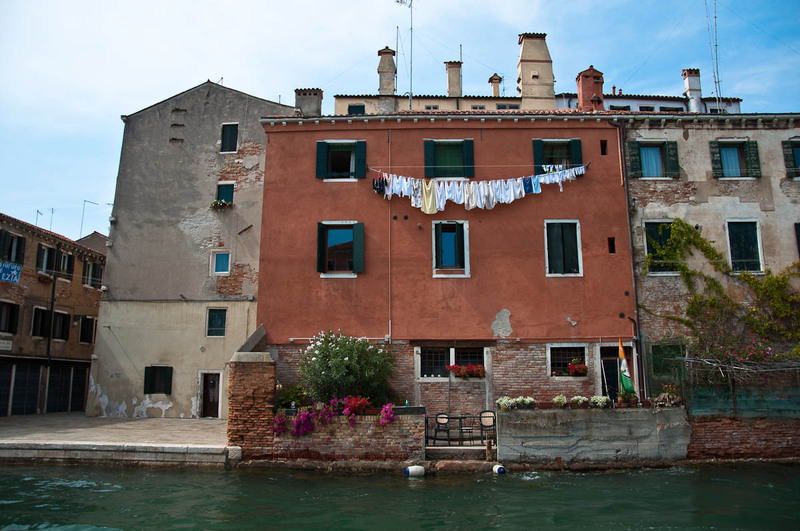 Click here to read more articles about Venice on my blog. Tips and tricks, places off-the-beaten track, art museums and historical events. I cover it all!